that Launched the Series and an All-new Interview with Lindsay Wagner! Universal City, California, July 21, 2010 - Fans can finally experience one of television's most memorable television series when The Bionic Woman: Season One debuts on DVD on October 19, 2010 from Universal Studios Home Entertainment. Relive the excitement of this groundbreaking television series starring Primetime Emmy(R)Award winner Lindsay Wagner as Jaime Sommers, a woman leading the ultimate double-life. Never-before-released on DVD in North America, this four-disc set includes every episode from the show's premiere season plus five crossover episodes from The Six Million Dollar Man, and a Bionic Beginnings featurette, which tracks evolution of television's first Bionic Woman and includes an all-new, exclusive interview with Lindsay Wagner. The Bionic Woman's 1976 premiere introduced delighted television viewers to a thrilling new kind of action hero - the blonde, brainy and beautiful Jaime Sommers. Armed with an astonishing range of superhuman abilities, Jaime goes undercover as a schoolteacher to take on a host of evildoers in 13 action-filled adventures that take her to every corner of the globe. (The Paper Chase) and Richard Anderson (Dynasty), along with an array of 1970s luminaries including Lee Majors (The Six Million Dollar Man), Andy Griffith (Matlock), Tippi Hedren (The Birds) and Kristy McNichol (Empty Nest"). 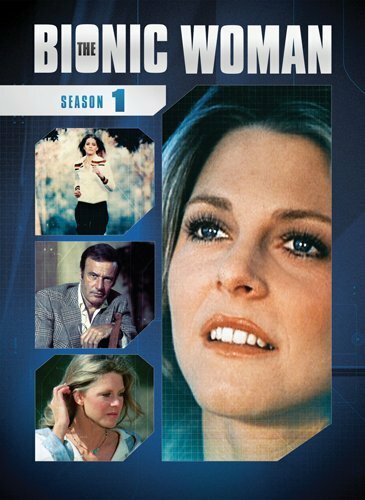 * The Bionic Woman - the original second season The Six Million Dollar Man episode where Jaime Sommers becomes the Bionic Woman. * "The Bionic Woman: Part II - Jaime Sommers is sent on her first assignment for theOffice of Scientific Investigations in this second season The Six Million Dollar Man" episode. * The Return of the Bionic Woman - Steve Austin learns that Jaime Sommers is still alive after seeing her die from a Bionic rejection. However, Jaime has suffered brain damage and no longer remembers anything about her past life, including Steve. * The Return of the Bionic Woman Part II -In an attempt to restore her memory, Steve Austin takes the recuperating Jaime Sommers to their hometown of Ojai, California. However, facing her past results in violent headaches and confusing flashbacks. * Welcome Home, Jaime - In The Six Million Dollar Man episode that launched The Bionic Woman spin-off series, Oscar Goldman arranges a job for Jaime as a schoolteacher, but she also insists on taking on the missions for the Office of Scientific Investigations. * Bionic Beginnings Featurette: Featuring an all-new interview with Lindsay Wagner, this featurette tracks the evolution of television's first Bionic Woman from her introduction in a two-part episode of The Six Million Dollar Man to the launch of her own series. * Episode Commentary: Commentaries featuring director Alan J. Levi, writer James. D. Parriott and writer/director Kenneth Johnson. She can run faster than 60 mph, bend massive steel bars, jump from insane heights and hear sounds you can only imagine. She's no ordinary schoolteacher... she's The Bionic Woman. Relive the excitement of this iconic TV series starring Primetime Emmy(R) Award winner Lindsay Wagner as Jaime Sommers, a woman leading the ultimate double-life. After her unforgettable appearances on The Six Million Dollar Man as Colonel Steve Austin's (Lee Majors) true love, Jaime's story begins anew in these entertaining Season One episodes as she learns to deal with her new bionic abilities, becomes a top-secret agent for the Office of Scientific Investigations and deals with her changed relationship with Steve. Now available in a four-disc set that includes five original episodes featured in The Six Million Dollar Man and a never-before-seen Bionic Beginnings Featurette, The Bionic Woman Season Onepromises non-stop action, excitement and adventure with the world's first female cyborg. Universal Studios Home Entertainment is a unit of Universal Pictures, a division of Universal Sts.com">www.universalstudios.com). Universal Studios is a part of NBC Universal, one of the world's leading media and entertainment companies in the develnt, production, and marketing of entertainment, news, and information to a global audience. Formed in May 2004 through the combining of NBC and Vivendi Universal Entertainment, NBC Universal owns and operates a valuable portfolio of news and entertainment networks, a premier motion picture company, significant television production operations, a leading television stations group, and world-renowned theme parks. NBC Universal is 80% owned by General Electric and 20% owned by Vivendi.